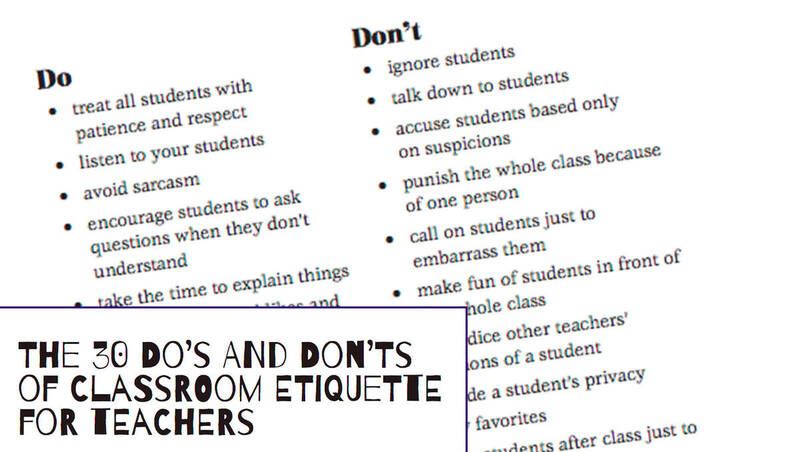 In pursuit of a courteous and harmonious classroom environment, this printable provides etiquette advice for both teachers and students. The 30 Do's and Don'ts are highly practical, and the student version can be printed and handed out or incorporated as part of a bulletin board. This resource is provided courtesy of Free Spirit Publishing, the leading publisher of positive, practical and pro-kid classroom materials for social-emotional learning, character education, gifted and talented learners, and special education. Explaining etiquette from common courtesies to cell-phone smarts to classroom decorum, Alex J. Packer blends outrageous humor with sound advice as he guides readers and explains why manners and etiquette are important—because people who know how to handle themselves in social situations come out on top, get what they want, feel good about themselves, and enjoy life to the fullest.